Folk art made to entertain children between 1760 and 1940. Readers will be introduced to an area of folk art collecting about which little has been written. This book fills an empty niche as a resource book for collectors of American folk art, antiques, toys, dolls, doll houses, paper dolls, and Americana. It addresses dating objects and examines economic and social influences that molded the artist’s creative expression. The reader will embark on a journey to discover types of handmade toys that have entertained children for one hundred and eighty years. On that journey recapture the illusive magic of childhood. Toys were designed to bring happiness, provide a learning experience, and to make children smile. I suspect you will too. 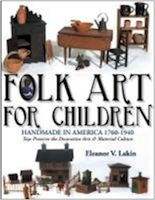 Explore this exciting area of folk art collecting, through the first book to study handmade American folk toys as an art form. Experience the social and economic forces that influenced and defined American folk toy design. Enjoy toy objects that uniquely preserve and document America’s decorative arts and material culture. Delight in a collection of captivating toys that includes: regional toy barns, hand carved teams of horses and other farm animals, farm equipment, dolls, doll clothing, Amish dolls and animals, quilts, period doll furniture, toy household furnishings, miniature redware, dollhouses, Victorian parlor room box, toy grocery store, action toys, soft sculpture animals, paper dolls, and more. The inventive genius of the American Folk Artist is apparent in toys they created for children, as well as full scale objects they made for profit and pleasure. Dare to take childish delight in the discovery of unusual toys. Immerse yourself in the handsome illustrations. Enjoy the exuberance, joy, and dynamic simplicity of these captivating childhood treasures. Pack your bags for the land of make believe. Experience the magic of folk art made for children. Eleanor Lakin was born in MD, a graduate of Virginia Polytechnic Institute State University with a Bachelor of Architecture, founded an architectural firm, practiced 30 years in MD, PA, and WVA. A 45 year romance with folk art resulted in a book that explores handmade toys from a unique perspective.